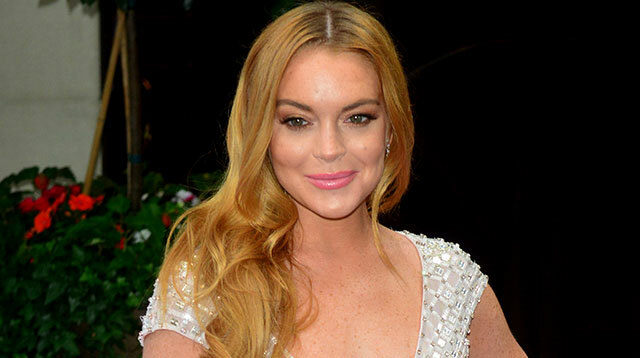 Lindsay Lohan is reportedly single as she waits for an apology from her former fiancé Egor Tarabasov. The Mean Girls actress became estranged from her Russian partner in July after she accused him of cheating on her. A video recently surfaced showing them fighting on a beach in Mykonos, Greece, along with another video of them having a heated argument at her home in London in which she claimed he tried to strangle her. Lindsay spoke about the incidents to The Mail in early August, insisting she was in an abusive relationship and he had allegedly attacked her before. The 30-year-old added she shouldn't stay with a person who "isn't prepared to say sorry" but she carried on wearing her engagement ring and she clung onto hopes of rekindling their relationship. However, she appeared to still be waiting for her apology when Lindsay posted a black-and-white throwback picture showing her seductively posing in lingerie. She wrote, "Maybe I go back to blonde? #noboyfriend #stillneedimsorry," hinting she no longer currently considers herself with a partner. Besides a close-up selfie of her placing her fingers to her lips, she referenced both Eminem and 50 Cent's 2003 song “Patiently Waiting” and Justin Bieber's recent track “Sorry,” by writing, "Like Eminem said 'patiently waiting' #letsgo like @justinbieber #N2LTSS." The latter acronym is thought to closely refer to the song lyrics, "Is it too late now to say sorry?" Lindsay previously said she wanted to make things work, but now she's not sure that she can. She revealed they had planned to marry in Lake Como, Italy in May 2017.